Sens. 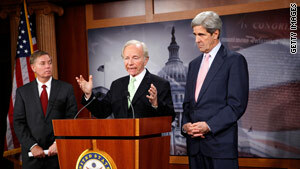 Lindsey Graham, Joe Lieberman and John Kerry talk about climate change legislation in December. Washington (CNN) -- Sens. John Kerry and Joe Lieberman are working to resurrect long-planned climate change legislation that got knocked off track last month after Republican Sen. Lindsey Graham stopped participating in talks about the legislation. Two Senate sources familiar with the plans confirm that Kerry, D-Massachusetts, and Lieberman, I-Connecticut, will likely hold a press conference next week to announce their bill. But Kerry told CNN Thursday that the details of when to unveil it are still being worked out. One of the sources said that Kerry continued to hold meetings with colleagues, business and environmental leaders and others even after original plans for a bipartisan bill with Graham crumbled. "We have a bill and we want people to see it," said the source. Looming large over this legislation is the oil spill in the Gulf of Mexico. The broad measure is expected to include proposals to expand both on- and offshore oil drilling. Sources familiar with the senators' plans say Kerry and Lieberman intend to keep those proposals in their bill, but they understand safety regulations and standards will and should be scrutinized and added to their legislation in the wake of the BP Deepwater Horizon oil spill. Democratic Sen. Bill Nelson of Florida has vowed to filibuster any legislation that includes an expansion of offshore drilling. Kerry, Lieberman and Graham were set to announce their bill April 26, but abruptly canceled their news conference after Graham angrily withdrew because of a dispute with Democratic leaders over immigration reform. The South Carolina Republican was furious that Senate Majority Leader Harry Reid had signaled he wanted to try to take up immigration reform in the Senate before climate change. Now, Kerry is hoping that there has been some time for "immigration politics settle out," according to the source familiar with the plans, and that even if Graham doesn't attend next week's possible announcement, that perhaps ultimately Graham would be on board. "Sen. Graham stands by this bill," Kerry said Thursday when asked if Graham is still supporting the legislation. However, Kerry added that he doesn't necessarily expect Graham to be at the unveiling because "we still have immigration issues." A spokesman for Graham has not yet returned CNN calls for comment. Some Democratic sources suggest that, despite the renewed push, it's unlikely that climate change legislation will make it to the Senate floor this year.